Published by Famous Music Corporation, New York, First Edition 1933. 1933. Vintage piano sheet music in colour illustrated paper covers. 12'' x 9''. Contains 6 pages. Scored for voice and piano with lyrics. In Very Good condition. 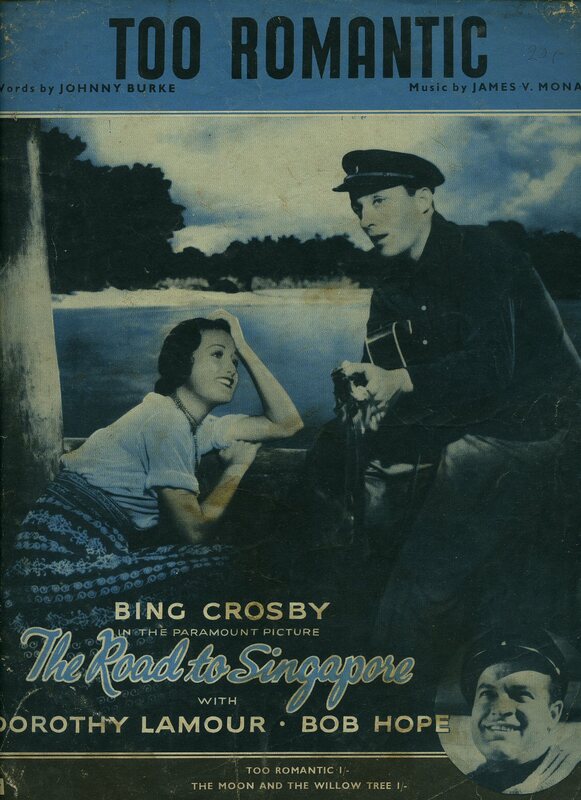 We currently hold in stock over 100 other pieces of sheet music sung by Bing Crosby. Member of the P.B.F.A. Published by Santly Joy Select, 1619 Broadway, New York First Edition 1938. 1938. 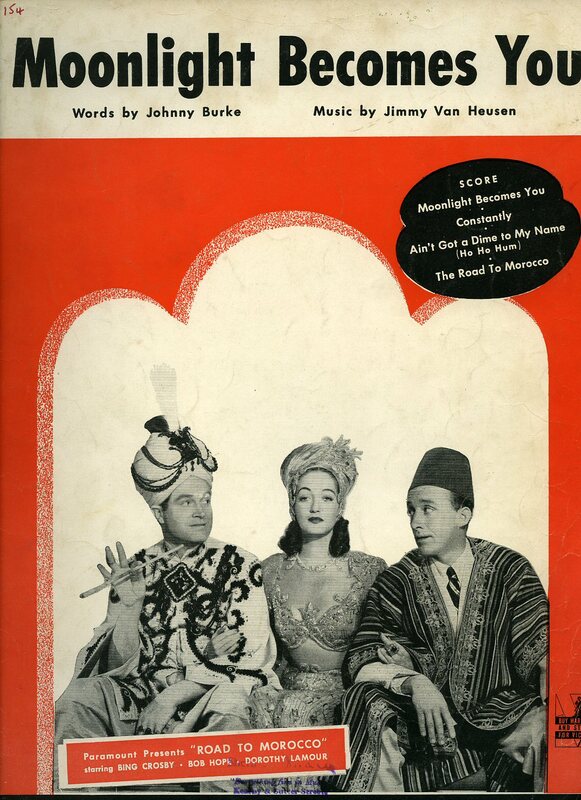 Published by Famous Music Corporation, 1619 Broadway, New York First Edition 1942. 1942. Published by Edwin H. Morris and Company Inc., 1619 Broadway, New York First Edition 1944. 1944. Vintage piano sheet music in colour illustrated paper covers. 12'' x 9''. Contains 6 pages. Scored for voice and piano with lyrics. Torn holes to the bottom of the spine and Very Good condition. 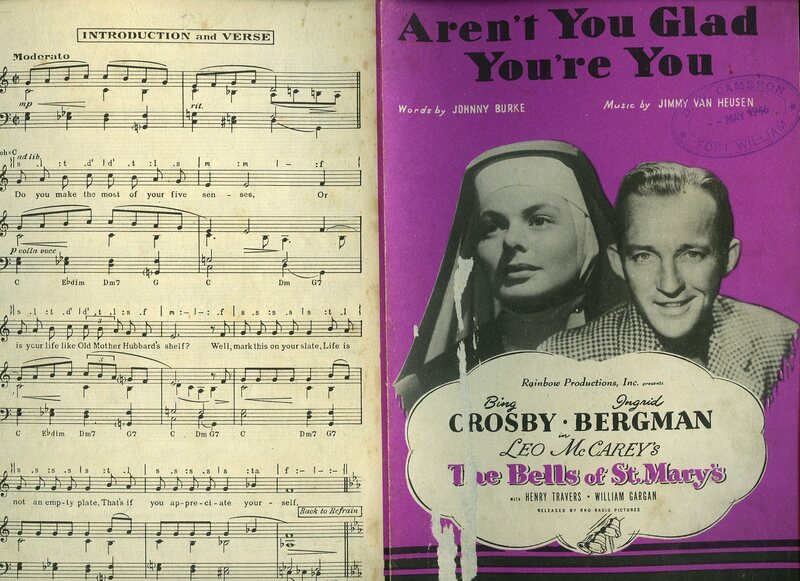 We currently hold in stock over 100 other pieces of sheet music sung by Bing Crosby. Member of the P.B.F.A. Published by Chappell and Burke and Van Heusen, Inc., 1619 Broadway, New York 1945. 1945. Vintage piano sheet music in colour illustrated paper covers. 9½'' x 6¼''. Contains 8 pages. Scored for voice and piano with lyrics. In Very Good condition. 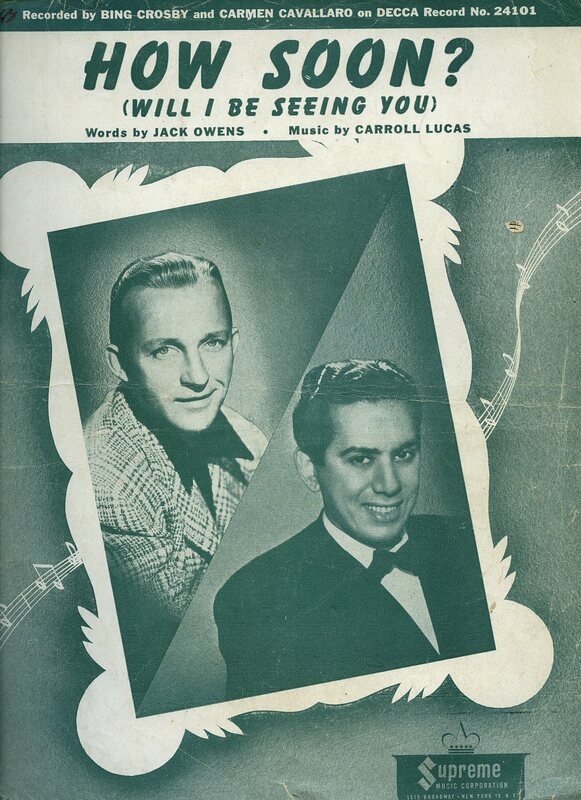 We currently hold in stock over 100 other pieces of sheet music sung by Bing Crosby. Member of the P.B.F.A. 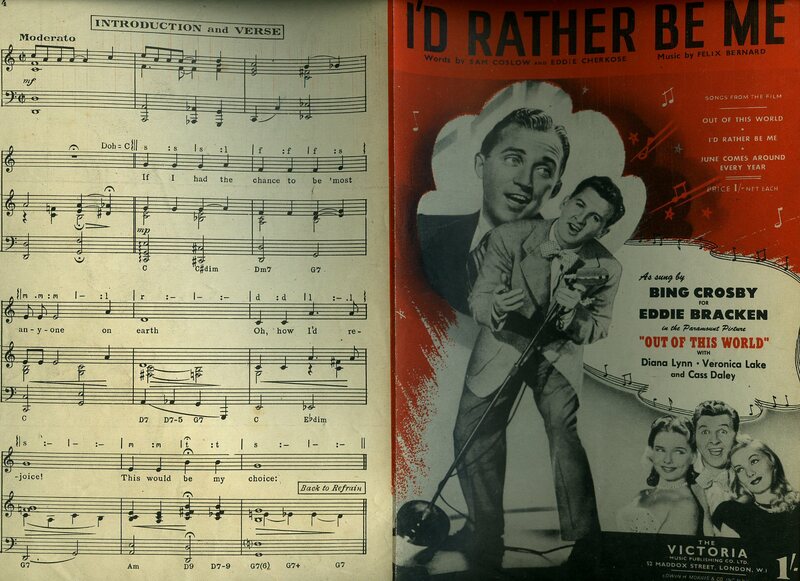 I'd Rather Be Me [Vintage Piano Sheet Music] From the Paramount Movie Production of "Out of This World"
Published by The Victoria Music Publishing Company Ltd., 52 Maddox Street, London 1945. 1945. Vintage piano sheet music in colour illustrated paper covers. 9½'' x 6¼''. Contains 4 pages. Scored for voice and piano with lyrics. In Very Good condition. 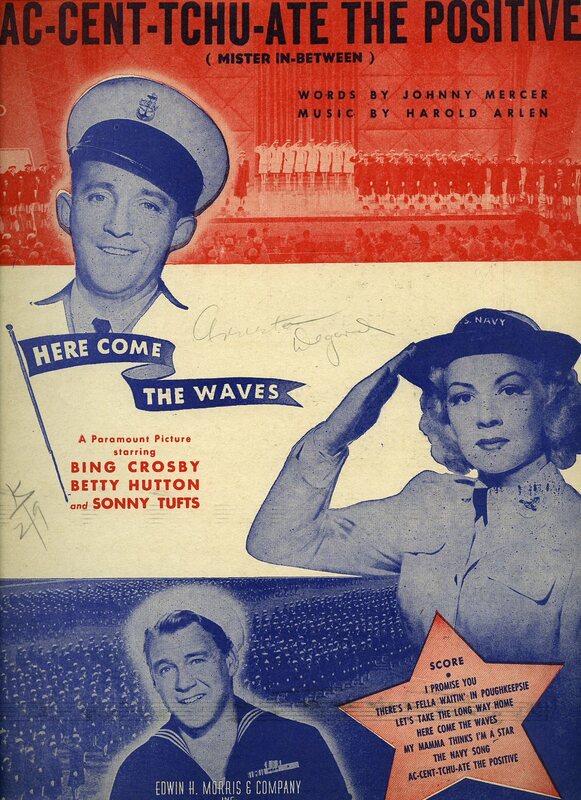 We currently hold in stock over 100 other pieces of sheet music sung by Bing Crosby. Member of the P.B.F.A. Bing Crosby [Harry Lillis "Bing" Crosby, Jr. (May 3, 1903 - October 14, 1977) was an American singer and actor. Crosby's trademark warm bass-baritone voice made him the best-selling recording artist of the 20th century] Words and Music by J. R. Shannon (James Royce Shannon) Piano arrangement by Ken Macomber. Published by B. Feldman & Co. 125-129 Shaftesbury Avenue, London circa 1944. 1944. Vintage piano sheet music in colour illustrated paper covers. 11'' x 8½''. Contains 4 pages. Scored for voice and piano with lyrics. In Very Good condition. 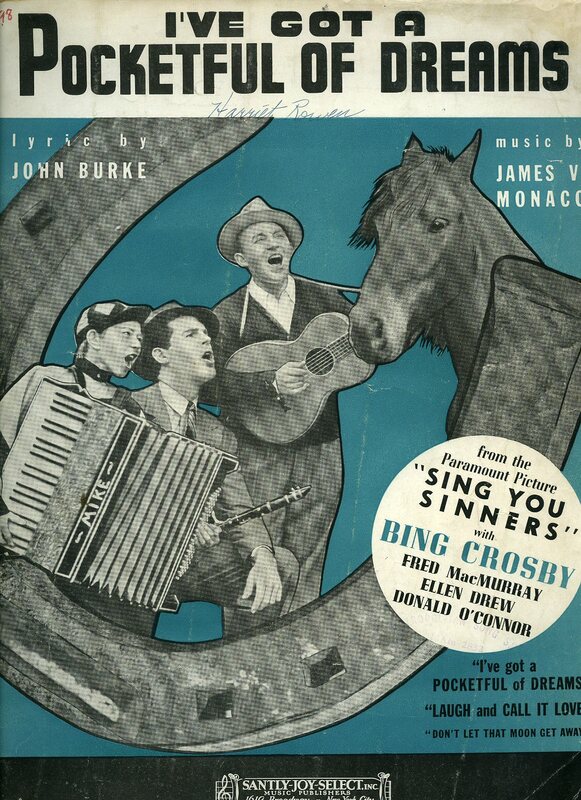 We currently hold in stock over 100 other pieces of sheet music sung by Bing Crosby. Member of the P.B.F.A. Published by Burke and Van Heusen, Inc., 1619 Broadway, New York First Edition 1945. 1945. Vintage piano sheet music in colour illustrated paper covers. 12'' x 9''. Contains 4 pages. Scored for voice and piano with lyrics. In Very Good condition. 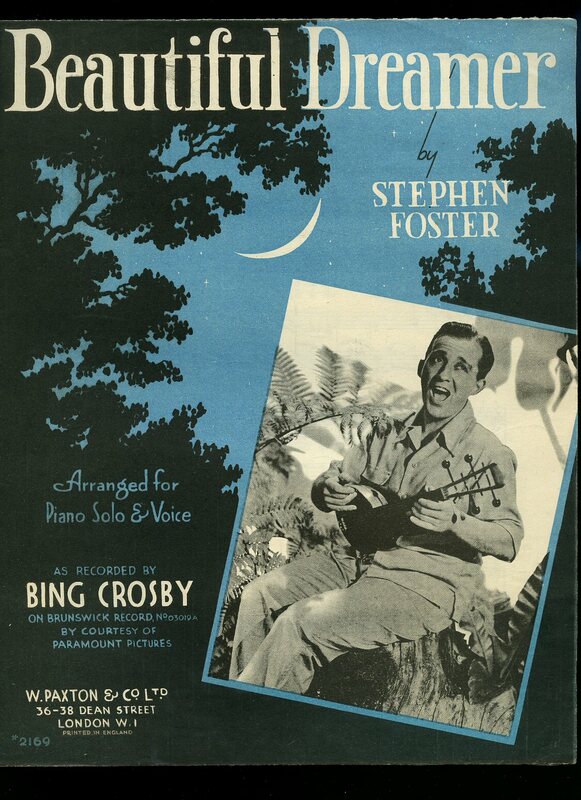 We currently hold in stock over 100 other pieces of sheet music sung by Bing Crosby. Member of the P.B.F.A. Published by Burke and Van Heusen, Inc., 1619 Broadway, New York First Edition 1944. 1944. Published by Supreme Music Corporation New York 1947. 1947. Vintage piano sheet music in colour illustrated paper covers. 12'' x 9''. Contains 4 pages. Scored for voice and piano with lyrics. In Very Good condition with small piece of paper missing from the bottom rear corner, not affecting the score. 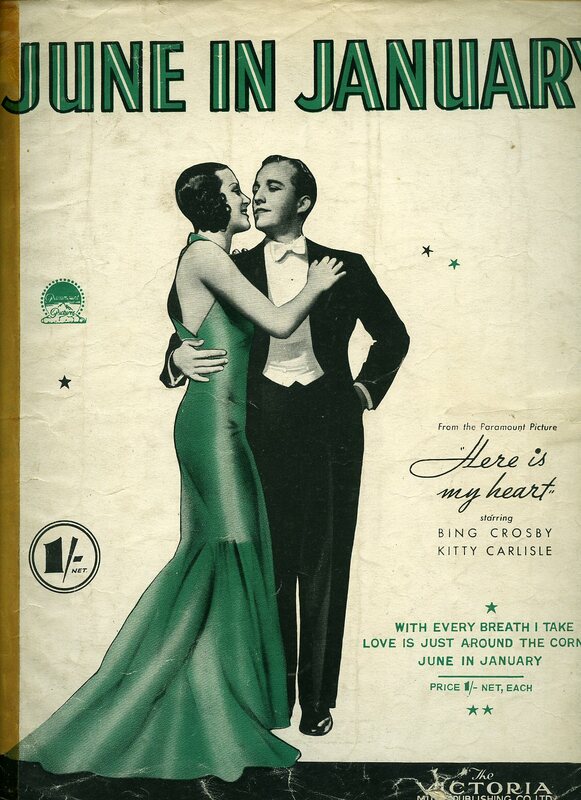 We currently hold in stock over 100 other pieces of sheet music sung by Bing Crosby. Member of the P.B.F.A. Published by The Victoria Music Publishing Company Ltd., 52 Maddox Street, London First UK Edition 1934. 1934. Vintage piano sheet music in colour illustrated paper covers. 12'' x 9''. Contains 4 pages. Scored for voice and piano with lyrics. Old tape repair down the spine and rear cover and in Good condition. 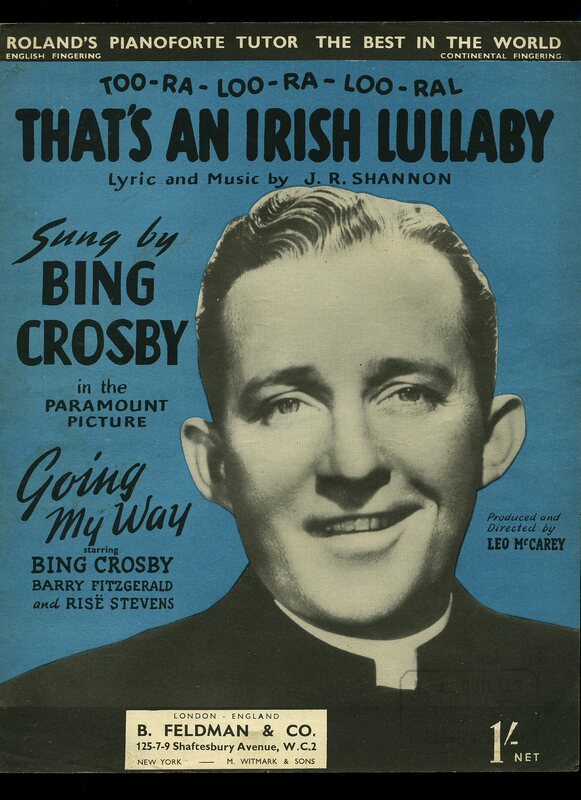 We currently hold in stock over 100 other pieces of sheet music sung by Bing Crosby. Member of the P.B.F.A. Published by The Victoria Music Publishing Company Ltd., 52 Maddox Street, London First UK Edition 1940. 1940. Vintage piano sheet music in colour illustrated paper covers. 12'' x 9''. Contains 4 pages. Scored for voice and piano with lyrics. Small tears to the edges and in Good condition. 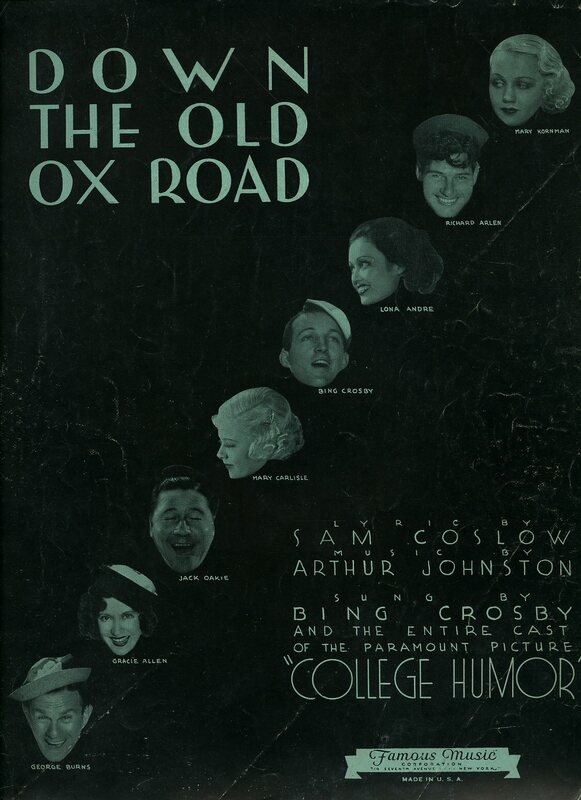 We currently hold in stock over 100 other pieces of sheet music sung by Bing Crosby. Member of the P.B.F.A. Published by Campbell, Connelly and Co. Ltd., 11 Denmark Street, London First UK Edition 1938. 1938. Vintage piano sheet music in colour illustrated paper covers. 12'' x 9''. Contains 4 pages. Scored for voice and piano with lyrics. Small tears across the top edges and in Good condition. 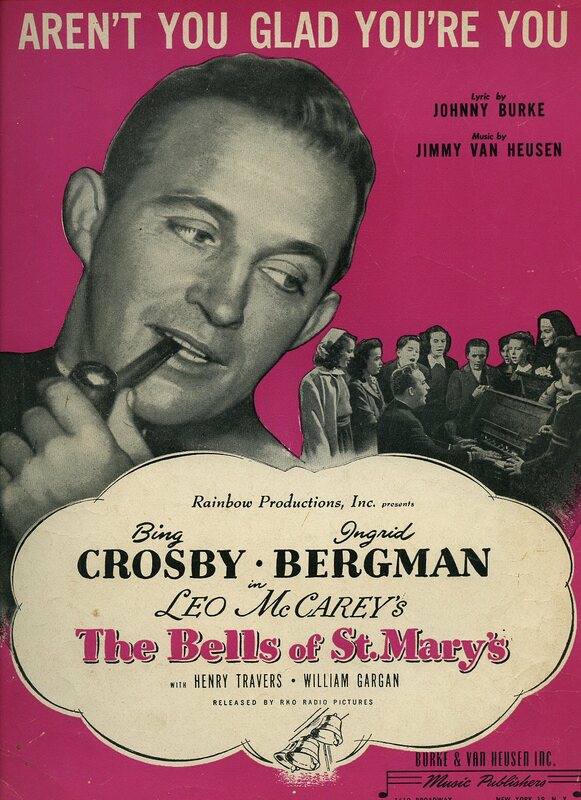 We currently hold in stock over 100 other pieces of sheet music sung by Bing Crosby. Member of the P.B.F.A. Published by W. Paxton & Co. Ltd., 36-38 Dean Street, London circa 1941. 1941. Vintage piano sheet music in colour illustrated paper covers. 11'' x 8½''. Contains 4 pages. Scored for voice and piano with lyrics. Sello tears to the edges and in Good condition. 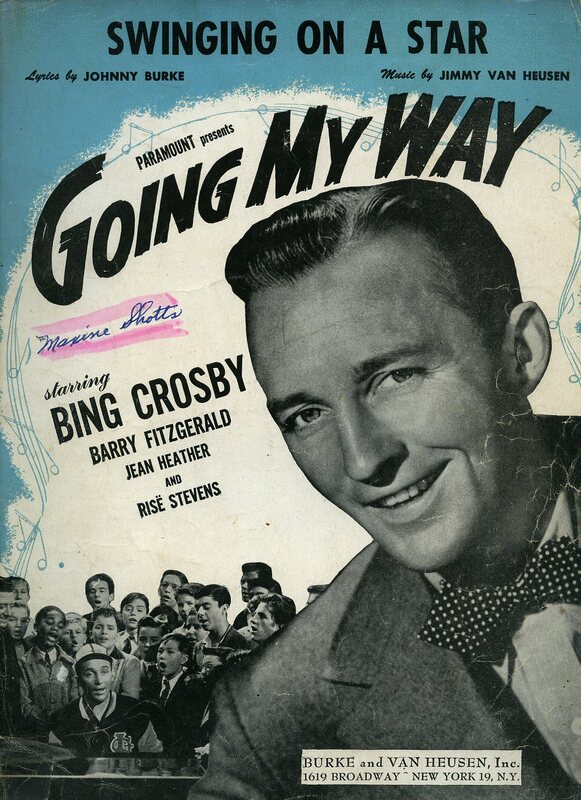 We currently hold in stock over 100 other pieces of sheet music sung by Bing Crosby. Member of the P.B.F.A.